BackgroundSocial network sites have been growing in popularity across broad segments of Internet users, and are a convenient means to exchange information and support. 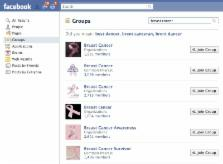 Research on their use for health-related purposes is limited.ObjectiveThis study aimed to characterize the purpose, use, and creators of Facebook groups related to breast cancer.MethodsWe searched Facebook (www.Facebook.com) using the term breast cancer. We restricted our analysis to groups that were related to breast cancer, operated in English, and were publicly available. Two of us independently extracted information on the administrator and purpose of the group, as well as the number of user-generated contributions. We developed a coding scheme to guide content analysis.ResultsWe found 620 breast cancer groups on Facebook containing a total of 1,090,397 members. The groups were created for fundraising (277/620, 44.7%), awareness (236, 38.1%), product or service promotion related to fundraising or awareness (61, 9%), or patient/caregiver support (46, 7%). The awareness groups as a whole contained by far the most members (n = 957,289). The majority of groups (532, 85.8%) had 25 wall posts or fewer. The support oriented groups, 47% (27/57) of which were established by high school or college students, were associated with the greatest number of user-generated contributions.ConclusionsFacebook groups have become a popular tool for awareness-raising, fundraising, and support-seeking related to breast cancer attracting over one million users. Given their popularity and reach, further research is warranted to explore the implications of social network sites as a health resource across various health conditions, cultures, ages, and socioeconomic groups. Being immersed in social networking environment: Facebook groups, uses and gratifications, and social outcomes. A Web survey of 1,715 college students was conducted to examine Facebook Groups users' gratifications and the relationship between users' gratifications and their political and civic participation offline. A factor analysis revealed four primary needs for participating in groups within Facebook: socializing, entertainment, self-status seeking, and information. These gratifications vary depending on user demographics such as gender, hometown, and year in school. The analysis of the relationship between users' needs and civic and political participation indicated that, as predicted, informational uses were more correlated to civic and political action than to recreational uses. Copyright statement: ©Jacqueline, L Bender, Maria-Carolina Jimenez-Marroquin, Alejandro R Jadad. Originally published in the Journal of Medical Internet Research (http://www.jmir.org), 04.02.2011. Tamoxifen treatment for breast cancer enforces a distinct gene-expression profile on the human endometrium: an exploratory study. Color-coded and spectral Doppler flow in breast carcinomas--relationship with the tumor microvasculature. Weight loss social support in 140 characters or less: use of an online social network in a remotely delivered weight loss intervention.